The new DATAMARS reader “GES3S” has been especially designed as portable livestock identification device with best-in-class reading performance. Fully water-proof (IP 67 class), the GES3S can be perfectly used for working in outdoor field conditions and reads all ISO HDX and FDX-B transponder in accordance to ISO Standard 11784/5 and ISO 11784-AMD1. 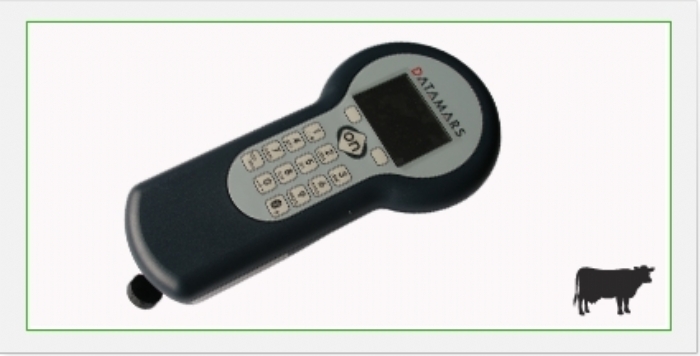 The GES3S reader allows data transfer via Bluetooth when scanning animals in the field and can be connected to a PC through a USB cable for data download. Thanks to the included Rumisoft software package, the management of the livestock application files becomes extremely easy and fast. The platform is backwards compatible with the one of its predecessor, the GES2S reader, and allows creating, downloading and modifying controls from/to both the GES2S readers and the new GES3S reader. The GES3S reader comes in a robust and practical suitcase with a USB communication cable, a lanyard and battery charger. Optional external stick antennas for extra flexibility can be easily connected to the GES3S reader for convenient reading of bolus transponders.